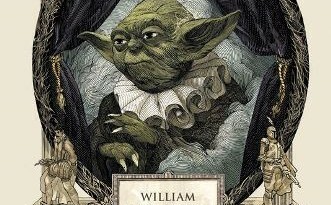 I have loved reading and reviewing the “Art of” books for Star Wars lately. As much as I love watching movies, I love learning about what goes on to bring the story to the screen. 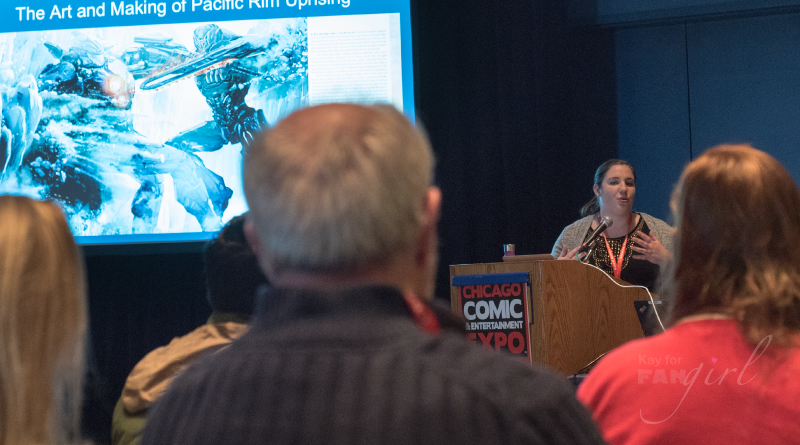 So when I saw From Concept Art to the Big Screen: The Art of Making an “Art and Making of” Book listed on the C2E2 panel schedule this year, I knew I had to go. 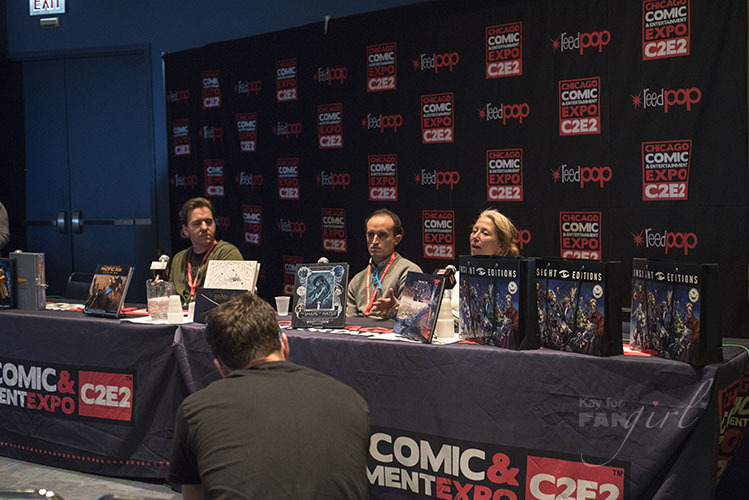 This panel put on by Insight Editions specifically focused on their journey from being a book packager to creating these behind-the-scenes books, but still gave a good look at all the thought and magic that this style of material requires and contains. While they’ve worked on books taking you into the development of Harry Potter movies, Pacific Rim: Uprising, and many of Guillermo del Toro’s works including The Shape of Water – Insight got its start in this realm with a property very near and dear to us at this website: Star Wars. Back when Lucasfilm decided they wanted to take the costumes from the first six Star Wars movies on tour, they determined they wanted an art companion book to go with it that visitors would be able to purchase at the end of the exhibit. 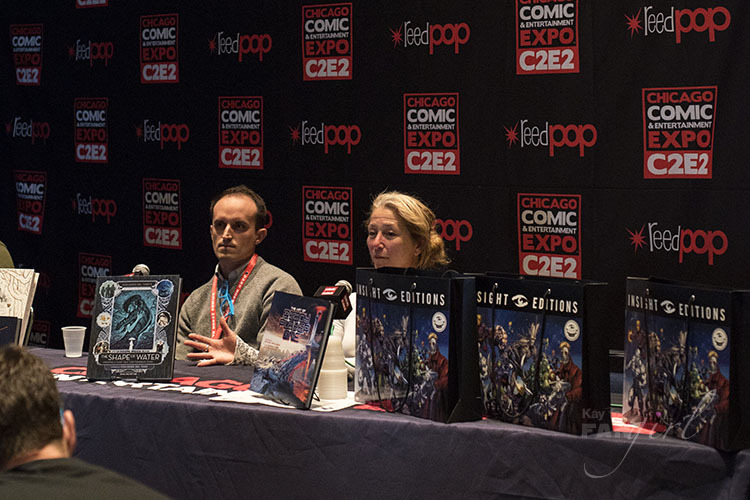 They approached Insight Editions and with seven months to work on it, Dressing a Galaxy was formed in both a regular and collector’s edition. Robbie Schmidt, who worked on that book, was on this panel and shared that when they got to go to the Lucasfilm archives, they found that George Lucas had saved every leftover bolt of fabric that was used to make costumes. This lead to the idea of including fabric swatches in the collector’s edition. Schmidt shared that 3,000 swatches were made from that original fabric, with at least 25 swatches in each book. Lucasfilm later came back to them for Sculpting a Galaxy: Inside the Star Wars Model Shop where the limited edition included special molds as well as a reproduction of the original model for Luke Skywalker’s land speeder. 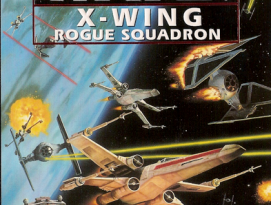 According to Schmidt working on Star Wars books is what launched Insight Editions into the Hollywood realm. Greg Solano, another panelist, spoke of his work with the Harry Potter film books. He wanted to pack them full of as much ephemera as a super fan would love. The first step for those Harry Potter art books, as well as most of the books they create, is to conceive how to organize the material. Typically the choice is made between chronological (production development schedule) or to focus on content department by department. With so much material to work with it can be a tough decision when it comes to choosing what makes it into the book. Solano spoke of talking with concept artists about their pieces. He said sometimes they don’t think people would want to see pieces that were rejected but 10 years later might be really proud of that same art. He finds it important to show work that’s never been seen publicly before. And since the books come with a higher price, he wants to make sure it is content you can’t get anywhere else. So once the organization of the materials has been decided on and maybe some of the art to go with it has been chosen, there’s still another big piece of the puzzle – shaping the manuscript. Another member of the Insight team, Marc Sumerak, expounded on how this can vary from project to project. He worked on a book for Guardians of the Galaxy that covered 50 years of the characters in the comics, intended as a primer for people new to the Guardians coming in to their stories via the movie. After conducting interviews with many comic creators he then pieced together that information while also curating all the images for the book. Conversely, Solano shared that on a Harry Potter retrospective he chose the images but there were tons of interviews with people involved in the film already digitally archived. So he was able to dig through existing materials and pull out information. This resulted in quotes coming from all different times in the Harry Potter movie-making saga but that thematically wove together. An audience member asked about challenges in the book-creating process especially with these types of books often coming out around and sometimes even a month before a movie comes out. 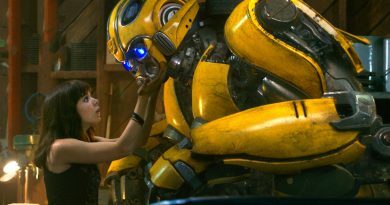 Since most of these books have a strong development focus, they tend not to be affected too much by changes in the film’s edit. Sumerak said the biggest challenge is making sure they’re telling a cohesive story within the book. Meanwhile Solano cited for him that narrowing down the images is often difficult. Sometimes they have to throw out great images because they don’t fit the narrative or they have to go with an image that might not be as visually stimulating but better shows something about a character. 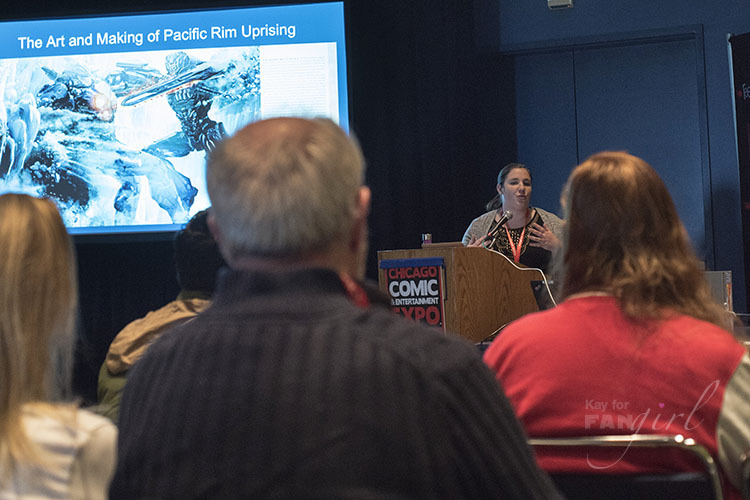 The team found that directors are typically open to talking with them about their movies because these “Making Of” books can be seen as a way to preserve a director’s legacy. Schmidt spoke of Guillermo del Toro’s willingness to share his journals. She said he’s constantly developing ideas in them and has a wealth of concepts for years before a movie is actually made and seen in theaters. What’s more Solano talked of learning how every piece to the puzzle of filmmaking is important. Often something like a book cover might be seen for a second on screen but a real person put a lot of time and effort into creating it. All those names in the credits, these books allow their work to really be seen. He enjoys seeing how divergent a character can be in the final cut from how they started and learning how and why they changed along the way. Following this experience with the artists, albeit in a shorter time span, makes him feel kind of like part of the team. When asked if they’re able to go back and enjoy watching these movies without thinking of the books they helped create about them, one panelist said he’s actually recently rewatched all the Harry Potter movies to see all the things he learned about the movie from working on the project. He saw it as an opportunity to watch the movies with fresh eyes. As for the future of “Art of” and “Making of” style books, the panelists talked about the other cool approaches that they’re working on. These include a Firefly in-universe manual intended for new crew members on the Serenity as well as in-universe travel guides. They also keep looking for ways to pull fans more into the books and inspire them to create such as a book that has wooden ships that you pop out, build, and paint. One member also mentioned doing more visual history books to include more fan art. She grew up wanting to be an astronaut. After seeing Star Wars, she wanted to be Princess Leia, Han Solo, and an astronaut. Life’s taken her on a bit of a different path, but she’s okay with that. Kay is FANgirl's resident geek fashion expert and co-host of the Hyperspace Theories podcast. She reviews books and movies for the site with a heart for storytelling and a mind that likes to analyze. Kay's been a guest on various podcasts sharing her love and knowledge of storytelling, film-making, fashion, and of course, Star Wars. Most days are filled with her work as a creative services professional - designing websites & branding, photographing, voice acting, editing, and more. Kay spends the little bit of free time she has reading, costuming, and, of course, making pew pew noises. She would pick up more jobs and hobbies if she was a Time Lord. She grew up wanting to be an astronaut. After seeing Star Wars, she wanted to be Princess Leia, Han Solo, and an astronaut. Life’s taken her on a bit of a different path, but she’s okay with that. Kay is FANgirl's resident geek fashion expert and co-host of the Hyperspace Theories podcast. She reviews books and movies for the site with a heart for storytelling and a mind that likes to analyze. Kay's been a guest on various podcasts sharing her love and knowledge of storytelling, film-making, fashion, and of course, Star Wars. Most days are filled with her work as a creative services professional - designing websites & branding, photographing, voice acting, editing, and more. Kay spends the little bit of free time she has reading, costuming, and, of course, making pew pew noises. She would pick up more jobs and hobbies if she was a Time Lord.